Unemployment is back in the headlines as redundancies rise and the level of job vacancies shrinks. But for millions it is nothing new. As part of a series on Britain's jobless, one woman who is seeking asylum in the UK explains how lack of work has touched her life. 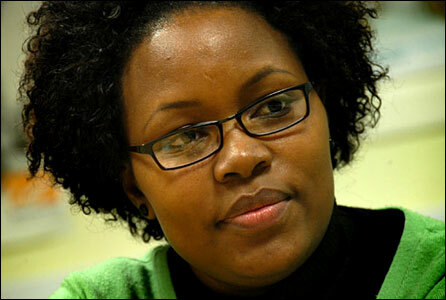 Until six years ago Chipo was a successful accountant and mother of two, living in her home country of Zimbabwe. Since fleeing the regime there and seeking asylum in the UK in 2002 she has been living without her daughters and without work. She has existed in limbo, hoping something will change. Chipo, 33, would love to be out working but UK government immigration rules mean she is not allowed. "If I had known I'd be in such a mess... I would have stayed in Zimbabwe and died in Zimbabwe, rather than wasting my life here," she says. Most of all she would like to go home, to her kids - now 13 and 10 - her parents and a Zimbabwe that was prospering again. Failing that, she would bring her children here and settle if she could. But while all those options remain out of reach she says she wants to make a contribution to British society, retain her skills, earn her own money and pay tax. Chipo is among hundreds of thousands of people in the UK who are not allowed to work because they are waiting for their asylum applications to be processed, or they have been refused refugee status yet not been removed from the UK. Thousands of Zimbabweans are in this position, because while the government has been refusing their asylum applications it has also halted the removal of people to the southern African country due to the volatile situation and risk of persecution there. Chipo fled her home country at a moment's notice after receiving threats because of her involvement with the opposition to Robert Mugabe's ruling party. "It was really hard for me to do that, to leave my kids. I feel guilty that I've left them behind in such a mess. But I hope one day we'll be reunited, we'll be together. "The relationship between me and my kids is growing apart. I've lost so much. "The children keep asking 'why are we still here and why are you there?' So many questions that I cannot answer." When she arrived in the UK she thought it would be easy to integrate and did not realise she would not be allowed to work until her solicitor informed her. She says that policy is "inhumane". "For people in the first world to treat people who are fleeing persecution, to be treated like this, that's very harsh." "I'm sure that's why we are finding some people are going into drugs, some are going into prostitution, just because they can't work. Many of them are very intelligent people who are wasting their talent and their skills." The Refugee Council, trades unions and other campaigners - including Labour MP Fiona McTaggart - are pushing for the rules to be changed. The Home Office says asylum applicants - with a few exceptions - are not allowed to work because it wants to "continue to prevent those seeking to use the asylum system as a cover for economic migration". Chipo survives mainly on help from family, friends and well-wishers. After her initial asylum claim was refused her benefits - worth about 30% below the level of Income Support - were cut off, and she got by for years on hand-outs from others. Having relatives in London means Chipo has been able to stay with them since her arrival, rather than be dispersed by the authorities to another city for support accommodation. With help from her solicitors she only recently gained the right to claim "hard case" support vouchers worth £35 a week, which cannot be used as cash and can only be exchanged in certain shops. "I cannot go and buy some food at the market. Each time you walk into a shop with vouchers I'm sure they all know you are someone who is not, you know, accepted. "In Zimbabwe you can't go around begging for money. Most people we know who beg for money are blind people who sit by the corner, but now we are reduced to that, here in the First World. To beg, it's so difficult. "We are used to work, to using our hands, to using our brains, but here we are encouraged to sit on them." Since her arrival the complex legal situation for Zimbabwean asylum seekers has changed numerous times as various test cases inch through the courts. After Chipo's initial claim was refused she was told to carry on reporting to Home Office officials, and was not forced to return to Zimbabwe. But one day in 2005, as she made her monthly visit to the immigration office, she was unexpectedly taken away to Yarl's Wood immigration removal centre. "No one knew I was going to be detained that day. I had no money with me, no phone. They were telling me then that I was going to be sent back." She was held there for three months. 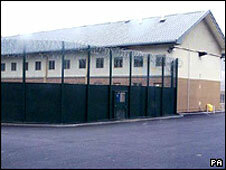 Chipo says her time in detention at Yarl's Wood was "mental torture"
"It was horrible. Horrible. Mental torture. It was like in prison, the food was horrible and I couldn't sleep. You are just nothing when you are in there, they are in control of your life." She was eventually bailed out by her solicitor after a separate court case ruled that people should not be sent back to Zimbabwe because of the risk of persecution. Recently Chipo has submitted a fresh asylum application - based on new evidence of her political activism - and keeps the faint hope she will be "lucky" enough to get settled in the UK. In the meantime she has occupied herself with some courses and voluntary work. She recently began a voluntary internship at the Refugee Council - helping the charity with research and lobbying politicians. But there is also a lot of "sitting, waiting" at home, trying to get through on the phone to her children - who are in the care of her elderly parents - and spending time talking to fellow Zimbabweans about their situation. Some days it is hard to get motivated, to pick herself up. "I've got lots of those days. "I would be very happy if I got protection here because things are deteriorating in Zimbabwe day and night. And I hope one day when things are OK there I will be able to go back. "But I can't plan anything, because I don't know what tomorrow holds."